This knitted doll clothes outfit will fit most dolls that stand 18-20 inches tall. Size 10 knitting needles will be used to create the intricate patterns and designs on the cloth. 1st row.—* K3, K2tog. MI, 1(2, MI, SKPO, Kl, repeat from * to last 2 sts., K2. 2nd row.—P2, * P2tog.tbs., Ml, P4, Ml, P2tog. P2, repeat from * to end. 3rd row.—K1, * K2tog. Ml, Kl, K2tog. Ml, SKPO, K1, MI, SKPO, repeat from * to last st., K1. 4th row.—P1, * P4, (K1, P1) into next st., P4, repeat from * to last st. P1., twice. Next row.—* Kl, P1, repeat from * to end. Repeat this row once more. Next row.—* K1, P1, Ml, P2tog. repeat from * to end. Next row.—* K1, P1, repeat from * to end. Next row.—K22, turn. Work 8 rows more on these 12 sts., then with right side of work facing, pick up and knit 6 sts. down side of st.st., then knit across 10 sts. on left-hand needle. Work 6 rows in st.st. 1st row.—K2tog. K14, K2tog. K8, SKPO, K14, K2tog. 2nd and alternate rows.—Purl. 3rd row.—K2tog. K12, K2tog. K8, SKPO, K12, K2tog. 5th row.—K2tog. K10, K2tog. K8, SKPO, K10, K2tog. 6th row.—Purl. For the whole pattern you will need a few small buttons, some ribbon, a bit of elastic, and some safety pins round out the demands for this pattern. Creating a pattern like this could be the perfect opportunity to introduce a young girl to the joys of knitting. The pattern provides a complete outfit for either a male or female doll. 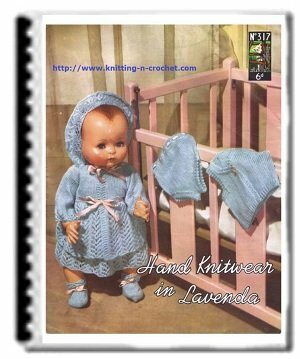 Detailed, stitch-by-stitch instructions are included for the delicate looking designs, but these knitted doll clothes will stand up to the abuses of play easily. For female dolls, the pattern includes instructions for a dress, matching bonnet, coat and booties. For male dolls, the pattern features directions for a vest, coat, diaper cover and booties. With all of these different pieces included, the pattern becomes a good deal. Any little girl would enjoy having a hand created outfit for their dolls. These knitted doll clothes will stand the test of time. When the girl becomes a young lady, she will fondly recall the doll outfit that you made for her, and be thankful that someone cared about them enough to make such a treasured item.